The rapid expansion of aquaculture has increased the demand for aquafeed. As fishmeal is expensive, alternative plant based protein sources such as soybean has shown to be a good alternative for aquafeed production. 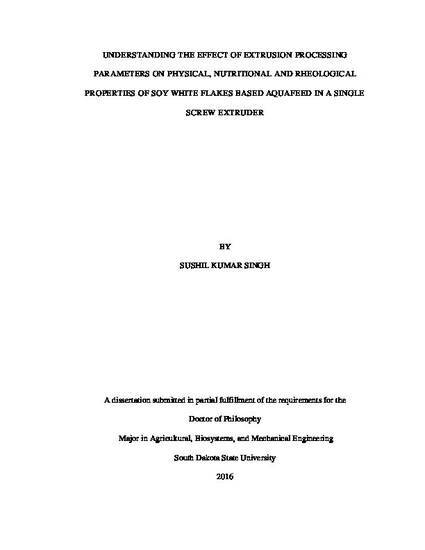 The present study was done to investigate the effect of soy white flakes (SWF) as an alternative source of protein in the production of aquaculture feed through extrusion processing. Ingredient blends containing different levels of SWF along with distiller dried grains, corn flour, corn gluten meal, fish meal, vitamin and mineral mix with net protein adjusted to 32% protein were formulated. The ingredient blends were extruded in single screw extruders and the properties of extrudates were studied. The experiments conducted includes: 1) effect of changing the level of SWF (10, 20 and 30%) along with other ingredients, moisture content (15, 25 and 35%db) and barrel temperature (110, 135 and 170oC) on properties of extrudates such as color, pellet durability, bulk density, water absorption and solubility indices, unit density and expansion ratio; 2) effect of changing levels of L/D ratio of die nozzle (3.33, 5.83 and 7.25), SWF (21, 29, 40, 52 and 59%) along with other ingredients, moisture content (15, 19, 25, 31 and 35%db) and barrel temperature (100, 110, 125, 140 and 150oC) on properties of extrudates such as pellet durability, bulk density, water absorption and solubility indices and expansion ratio; 3) effect of changing levels of screw speed (100, 150 and 200 rpm), SWF (20, 35 and 50%) along with other ingredients, moisture content (20, 25 and 30%) and barrel temperature (110, 125, 140oC) on properties of extrudates such as pellet durability index, bulk density, water absorption and solubility indices and mass flow rate; 4) effect of changing levels of SWF along with other ingredients, moisture content, barrel temperature and screw speed on nutritional properties of extrudates such as protein content, fat, fiber, ash content, lysine content and trypsin inhibitor activity and also to optimize the processing conditions to maximize the nutritional quality; 5) development of a viscosity model incorporating a correction factor for SWF along with correction factor for temperature and the effect of extrusion processing parameters on mass flow rate, torque, specific mechanical energy and viscosity of dough and 6) rheological characterization and CFD simulation of SWF based dough. In the initial study, increasing the level of SWF from 10 to 30% resulted in increase in water absorption index and unit density but decrease in expansion ratio. The interaction effect of SWF content, moisture content and temperature were significant for color, pellet durability index, bulk density and expansion ratio. All the extrudates showed relatively high pellet durability and inclusion of SWF produced less expanded and more compact textured extrudates. In the experiment to determine the effect of die dimensions, response surface methodology was used to find the effect of screw speed, SWF level, moisture content and barrel temperature on the physical properties of extrudates. Quadratic polynomial regression equations were developed to correlate the product responses and process variables as well as to obtain the response surfaces plots. The independent variables had significant (P< 0.05) effects on physical properties of extrudates: (i) higher soy white flakes content increased the pellet durability index and water absorption index, but decreased the water solubility index, (ii) higher temperature decreased pellet durability index, bulk density and water solubility index, (iii) increase in L/D ratio from 3.33 to 7.25 increased the pellet durability index, expansion ratio but decreased the bulk density of the extrudates. In the experiments with different screw speed level (100 to 200 rpm) and SWF levels (20 to 50%), it was observed that increasing screw speed resulted in increase in pellet durability and mass flow rate but decrease in water absorption index of the extrudates. The results of the experiments shows that aquaculture feed with high durability, lower bulk density and lower water absorption and higher solubility indices can be produced with ingredients mix containing 40% SWF net protein content adjusted to 32% using single screw extruder. In the experiment to determine the effect SWF content, moisture content, barrel temperature and screw speed on the nutritional properties of the extrudates, response surface methodology was used. Response surface regression models were established to correlate the nutritional properties of extrudates to the process variables. SWF was the most significant variable with quadratic effects on most of the nutritional properties. As level of SWF content was increased from 20 to 50%, there was an increase in lysine content, TIA, protein content, ash content and decrease in fat and fiber content. Increasing temperature resulted in decrease in lysine content and trypsin inhibitor activity of extrudates. It was also observed that increase in the soy white flakes content resulted in a higher mass flow rate, torque and specific mechanical energy and a decrease in the apparent viscosity. The specific mechanical energy, mass flow rate increased and viscosity decreased with increase in screw speed. Higher barrel and die temperature led to decrease in the apparent viscosity of the dough, torque and specific mechanical energy. The flow of SWF based dough in a single screw extruder was simulated by using computational fluid dynamics (CFD). Process conditions considered were screw speeds (40, 80, 120, 160, 200 rpm), barrel temperature (100, 120, 140oC) and SWF contents (30, 40, 50%db). Simulation results were validated quantitatively by experimental data. The results showed good agreement between experimental and computational results. Moreover, the flow profiles in the extruder were analyzed by using the influence of screw speed and level of soy white flakes content. Qualitative behavior of local shear rate and viscosity along the screw were analyzed and comparisons of different process conditions have been presented.